I had never really thought about this until I saw it. I think that this is especially true for me these days. Don’t get me wrong I’m not fronting or anything I just feel as if I live several different lives all mixed into one which sometimes don’t blend. I have a work life which excels and has its own roller coaster ride and I can never quite tell if I’m doing well or if I’m doing poorly. I suppose if I were doing poorly I would have lost my job, right? Then again I often get mistaken for a high school student in this environment and since most people don’t know me they are always asking me questions about myself, the job, or leaving their thoughts. I could swear that my personal life is nearly non-existent since for the most part I have been concentrating on saving money and not really doing that much. I just hung out with my BFF and her significant other and they happened to drop the bombshell about their upcoming trip out of the country like it was no big deal. Of course, she assumes she told me and then when I couldn’t find her in coming week would be really confused as to why I wasn’t notified that she was out of the country! I’m really trying to get out there and change things in this area so that I have more of a personal life, but those changes are still in the works. Then I have an internet life which includes this blog, a tumblr, youtube, and facebook. None of those have really bleed together, but they do happen to bleed into my personal life and my work life. Seriously, what would the point of having a facebook be if you didn’t have a life in the real world? This blog is mostly where I write and post things that I think are important although I have been doing very badly at that these days. The tumblr which I have been obsessing over lately because its so easy has mostly pictures and very little writing. It’s quite sad and pathetic really. The youtube has only 1 video though I keep intending on wanting to make and add more videos. I follow and watch random videos on there mostly makeup gurus which I find fascinatingly intriguing in the oddest sense. I have a twitter and that tends to bleed over into everything. The work life somewhat, the personal life somewhat, but mainly the internet life where it bleeds, youtube and tumblr. I find it very odd that, that is the only place where my life really blends together. I never really meant on having so many separate sections of my life, but somehow it happened. Does anyone intend to do anything that seriously? Is it like having different groups of friends? I’m not sure. 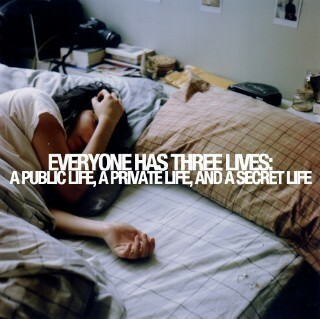 I definitely have a public life, a private life, and a secret life. Tell me how many separate lives do you have?